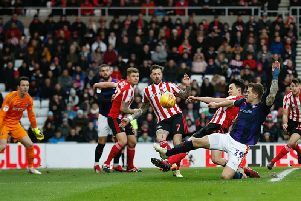 Luton boss Mick Harford felt his side could have had even more players included than the three that were named in the EFL League One Team of the Season last week. Striker James Collins along with full backs James Justin and Jack Stacey were all selected, with second placed Barnsley having four of the 11 chosen. It could have been more, I thought Shins deserved a place in there, but everyone knows that we’re a great team and right now no-one can stop us. The likes of Sonny Bradley, Matty Pearson, Andrew Shinnie and Pelly-Ruddock Mpanzu all missed out though, as Harford said: “Those three definitely deserved it, and maybe a few more. “There’s been some outstanding individual performers this season for the football club. “But we’ll respect that, we believe some other players should be in the team, because all of the team have performed at very high levels this season. Midfielder Mpanzu, who is up for the EFL Goal of the Year honour, also felt there could have been more Hatters included, saying: “Jack and JJ have been great all season and Collo’s banging in the goals, so we can’t really complain. “Sheasy (James Shea) has been great even though he’s done nothing, it’s been Matty and Sonny helping out. Striker Collins was also bemused there wasn’t a larger Luton contingent, saying: “It’s thoroughly deserved and I’m surprised a couple more didn’t get in there with some of the performances this year. It wasn’t just the team awards that Luton dominated, with Collins up for League One Player of the Year and Justin, the EFL Young Player of the Year. Meanwhile, Justin added: “It started off okay for me but then as soon as I got in the team I feel I’ve taken my chance and performed consistently throughout the season. “It’s just a pleasure to get into the team and then be nominated for Young Player of the Season. On Justin’s nomination, boss Harford said: “He’s up against two good players, (Harry) Wilson at Derby and (Max) Aarons at Norwich City, who are very, very good players. “When I’ve watched Norwich play, that kid’s a real, real good player, so for JJ to be in amongst that lot, it’s just testament to what he’s done and how far he’s come in terms of his development. Finally, for Mpanzu to be in the running for the top goal honour, the midfielder added: “Any award is a nice award as it’s always a team game.